Don’t let the cover fool you. This is not Superboy Prime. There really isn’t a big reveal that sends Superman’s son into complete and utter madness. What it is, is Jon Kent relating how he’d bitten off so much more than he could chew. He started out as an 11-year-old boy cooped up on a starship with his crazy scientist grandfather, and things only got messier from there. Grandpa Jor-El took the boy on one super-powered mission after another, running afoul of scantily clad Green Lanterns and trying to earn the same kind of respect as Clark. What’s an adolescent boy not to love about that? But I will say this: Have you ever been enjoying a TV show or movie, and it features a reference to something so obscure that you instantly feel as if the entire production was intended for you and you alone? There was a moment like that for me, and it completely elevated my rather shallow opinion of contemporary comic books. Unfortunately it won’t last, but as I sit here writing this, I’m still a little high from it. 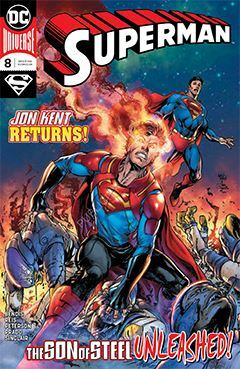 Jon’s story will continue next issue, so if you want your Superman fix, you should probably check out the latest issue of Action Comics, while this series is (temporarily, maybe) retitled Superboy. But that may not be a bad thing.